The Bata Library at Trent University is donating 250,000 books to the Internet Archive to be digitized and preserved for easy access by all students and future generations. The Internet Archive is a non-profit digital library offering free universal access to books, movies, and music, as well as 338 billion archived web pages. The Internet Archive’s Open Libraries project aims to bring four million books online, through purchase or digitization, while honouring the rights of creators and expanding their online reach. The Open Libraries project with the Internet Archive allows Trent University to make more space for innovative new spaces and technologies in the refurbished Bata Library, opening this fall. “Trent is extremely pleased to partner with the Internet Archive to share and preserve an important part of the Bata Library’s rich print collections,” says university librarian Robert Clarke, university librarian. The donation of books for digitization will allow Trent University students and faculty to continue to have access to resources once held at the Bata Library and, at the same time, will provide access to readers worldwide through the Open Libraries’ controlled lending program. 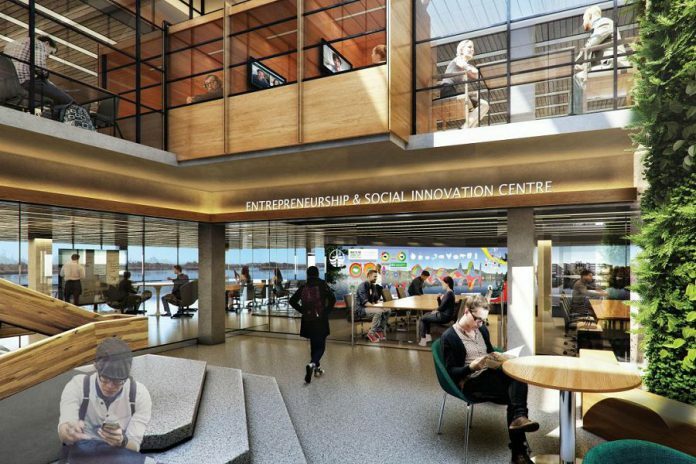 The transformed Bata Library will include an entrepreneurship and social innovation centre, visualization labs, research centres, makerspace, interactive student spaces, a living wall, and much more.